Nagoya (名古屋市), Japan’s fourth-largest city, is the capital of Aichi Prefecture, located in central Honshū on Ise Bay, as well as the political, financial, and cultural centre of the Chubu Region, halfway between Tōkyō and Ōsaka. Located on the fertile Nōbi Plain, the region was early settled. Several kofun (mounded tombs) are located in the south-central section of modern-day Nagoya, such as the Shiratoriryō, said to be the tomb of the mythical Prince Yamatotakeru (日本武尊), whose sword Kusanagi is still kept at Atsuta Shrine in Nagoya. The town prospered around the shrine, and in the sixteenth century, it became the military base of the Imagawa clan (今川氏), who built a castle, which was later taken over by Oda Nobunaga. With the unification of Japan by Tokugawa Ieyasu and the construction of Nagoya Castle in 1609-14, the city became the stronghold of the Owari domain, one of the three successor houses (御三家 gosanke) of the Tokugawa dynasty. Nagoya thrived under the patronage of successive daimyō as a cultural centre and continued its essential role until modern times. The city suffered extensive destruction during World War II. Nowadays, Nagoya is a modern metropolis with wide boulevards and thirty satellite cities within a forty-kilometre radius. It has turned into an economic and industrial powerhouse after the war. The principal industries are automotive (Lexus, Mitsubishi Motors R&D) and automotive suppliers, transportation, chemicals, steel, robot industries, and ceramic ware. Nagoya has traditionally been known for its enamelware (七宝 shippō, cloisonné). Nagoya is also the seat of JR Central, the famous porcelain manufacturer Noritake, and various domestic and international enterprises. Housing the heirloom of the Owari branch of the Tokugawa family, who ruled from Nagoya Castle. The collection included artefacts inherited from the first shogun Tokugawa Ieyasu as well as a Noh stage, costumes, armour, and weapons. 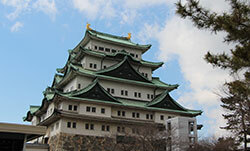 Built by Ieyasu between 1609-14, Nagoya Castle was destroyed by American air raids in 1945. The replica was completed in 1959. It is famous for the gold-plated dolphins on top of the donjon, the symbol of Nagoya. 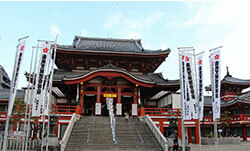 Said to have been founded in the first century CE, Atsuta Shrine is one of Japan’s major Shintō shrines, holding the sacred sword Kusanagi no Tsurugi. Ōsu Kannon, also known as Hōshō-in, was originally built in 1333 by Emperor Go-Daigo, but destroyed by fire in the 1820s and rebuilt in 1970s. Sakae (栄): located in Naka Ward, Sakae is Nagoya’s central shopping and entertainment quarter. Hisaya-ōdōri-Koen, a park that splits the central boulevard, features the 180-meter tall Nagoya TV Tower constructed in 1954. 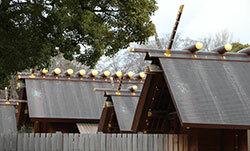 Hisaya-ōdōri offers an abundance of restaurants, cafes, and bars. Next to the TV Tower there the UFO-shaped Oasis 21 terminal, a bus station covered with a shallow pool of water and an ice-skating rink in the winter. Right behind Oasis 21 are the Aichi Arts Centre, a concert and performance hall as well as the Aichi Prefectural Museum of Art (愛知県美術館; open Tuesday to Thursday, Saturday and Sunday from 10:00 to 18:00, Friday from 10:00 to 20:00, 500 JPY admission), the venue of the annual Aichi Triennale, an international arts festival. The Toyota Commemorative Museum of Industry and Technology illustrates Toyota’s history, from its origins as a textile factory to its current automotive production. The museum is housed in an old brick building. The Nagoya Station Tourist Information Center is located in the main hall of the JR station and is open daily from 09:00 to 19:00. The Nagoya International Centre is opened from Tuesday to Sunday from 09:00 to 19:00 (3F in the Nagoya International Centre Bldg. ), offering a library, internet access as well as English-speaking volunteers. Three major train lines serve Nagoya, and their stations are close together in the centre of the city. The JR main station is where the shinkansen and all other regular JR services arrive. The Meitetsu terminal for trains to and from Inuyama and Gifu is situated south of the JR station, while the Kintetsu terminal for trains to Nara and the Shima Peninsula is just adjacent to Meitetsu. The highway bus terminals are located north of the JR station and at the Oasis 21 terminal in Sakae. International and domestic air travellers arrive at the Central Japan International Airport (中部国際空港 Chūbu Kokusai Kūkō, also known as Centrair) situated on a reclaimed island thirty kilometres south of Nagoya. The airport itself is popular with tourists, offering a large variety of restaurants and a large airport bath that allows you to watch landings and take-offs while soaking in hot water. The Meitetsu Airport Line (名鉄空港線) connects Centrair with the city (28 minutes, 1,200 JPY on the μSKY [μ pronounced myū] rapid limited expresses, 850 JPY on slower services). In addition to trains run by JR Central, Meitetsu and Kintetsu Lines connecting Nagoya with other cities and regions, there is an efficient network of public transportation consisting of public buses as well as six subway lines. 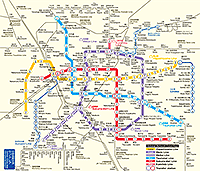 The four most commonly used subway lines are the Higashiyama Line (yellow on the subway map), the Meijō Line (purple), the Sakura-dōri Line, and the Tsurumai Line (blue). Subway tickets start at 200 JPY for adults and 100 JPY for children and increase in increments of 30 JPY per zone (five zones in total). There are also plenty of local bus lines: general buses, key route buses, city loop buses, local circuit buses (all at 200 JPY for adults and 100 JPY for children, plus a 10 JPY surcharge on express buses), and night buses (at 400 JPY for adults and 200 JPY for children). The “1 Day Bus & Subway Combination Ticket” comes at 850 JPY for adults and 430 JPY for children. The Me-guru (メーグル) Sightseeing Route Bus runs from Tuesday to Sunday and loops around the major tourist attractions of Nagoya. The ticket is 500 JPY for adults (250 JPY for children). 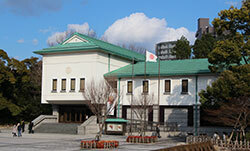 Tokugawa Art Museum in Nagoya: the treasures of the Owari branch of the Tokugawa family. Ōsu Kannon (大須観音) belonging to the Shingon sect located in central Nagoya. Shike-michi (四間道) is a small historical street in Nishi-ku, Nagoya.